I wrote this poem a few years back and gave it to my parents and my in-laws for Easter. 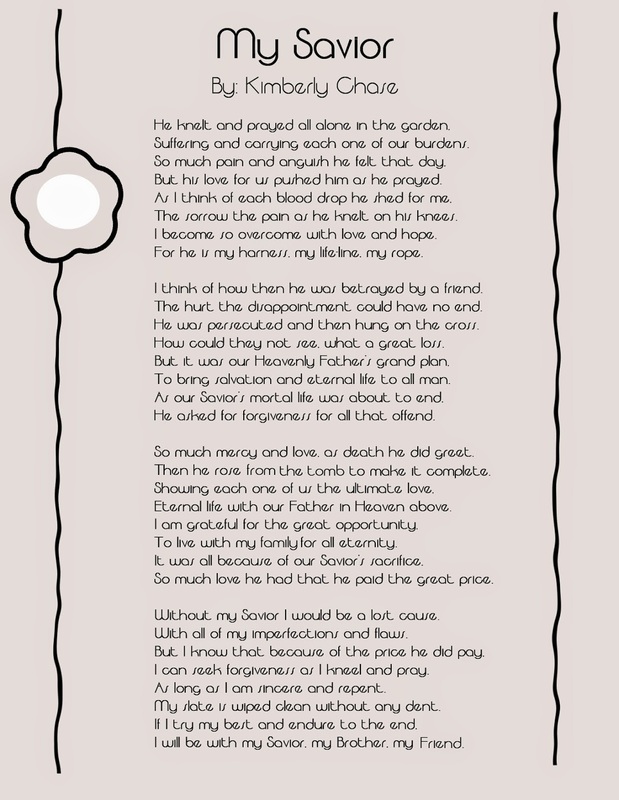 I guess I would say that it is my testimony of the atonement and the resurrection and everything that my Savior has done personally for me, just written in poem form. I am so grateful for my Savior's atoning sacrifice. It is unimaginable the immense pain he suffered emotionally and physically. I was watching one of the videos on lds.org the other day and I winced as I watched the Savior whipped and mocked. To think that he endured all of that because of his love for each of us. I have a very firm testimony of this love, I have felt the peace and comfort that comes from partaking of the blessings of the atonement. I wanted to make this poem available during this time where our thoughts are more focused on the Savior.